Willow, like most young babies, loves to be held tight or swaddled up tightly, it stops her screaming, settles her and helps to send her off to sleep (as well as constant rocking in the rocking chair). As I am typing this Miss Willow is sound asleep in her cradle, securely bundled up in her Love To Swaddle UP. Before I had even used this swaddle myself, its reputation preceded it. I remember talking to some of my Mothers group Mums about how Ezra loved having his arms up when he slept and would always fight so hard to get them out when I swaddled him. He hated having his arms pinned down to his side, so I basically had to give up swaddling really early on. My Mummy friends raved about the Love To Swaddle Up, but unfortunately for me I found out about this product too late for Ezra, he was already well and truly out of swaddles. So, when I was contacted about reviewing one, I was ecstatic, from all the great things I had heard, it was already on my 'must buy for baby' list. In fact, I had already bought several of them, since I found out about them, for all of my friends and family who had had baby showers, but I was still yet to test it out myself. I've been using this swaddle pretty much consistently since we bought Willow home from the hospital. I have found she is much like her older brother and hates having her arms strapped down by her side. If I do the traditional swaddle, I hear her straining and groaning to free her arms until she eventually does and then she is usually wide awake by that time, or she just won't have a deep sleep because she keeps startling herself awake. With the unique design of the Love To Swaddle UP, Willow has her hands up by her face already, but they are confined to the swaddle so she doesn't startle herself or scratch her face. I've noticed that she will often will rub her face with her hands or use them to push her dummy into her mouth! So clever, because I'm sure she (like apparently 90% of babies) was used to doing the same thing in the womb. I've noticed that the parts where her hands are, are often dirty or a little damp because she much put them in her mouth throughout the night and helped herself to settle and feel comforted. 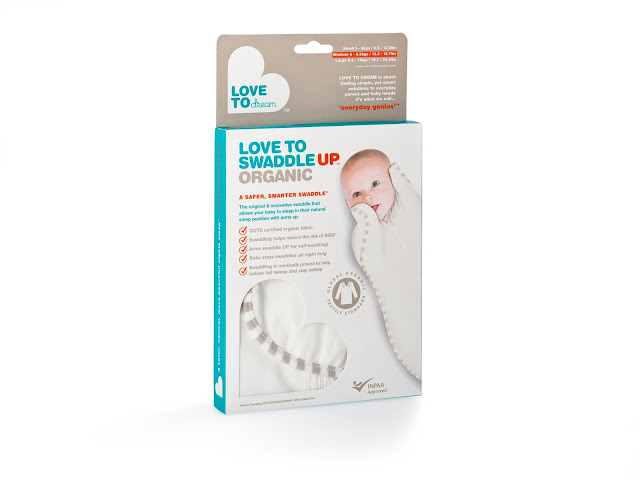 The folks at Love To Dream have also offered another Love to Swaddle UP Organic for me to GIVEAWAY to one of you! YAYYY! So, if you want one, then come on and enter the giveaway below, it is really easy, and you just might get a super useful product that retails for $41.95 for FREE! You get to pick the size of your choosing, and even if you aren't having a bub soon, I'm sure you know someone who is. They make a great baby shower gift! 19 comments on "Love To Swaddle UP Organic: Review and Giveaway"
My fingers are crossed as this is one of my most wanted items on my baby list for baby fritch! I don't know anybody that's expecting so I won't enter the comp, but have to say this looks like a brilliant idea! Baby looks lovely! Gosh I love babies! I am surrounded in them and currently have one of my own. Thanks for the review! I love these swaddles, I used one with my son and have bought some to use with my second bub, they are the best! I would love to win one of these swaddles as my new baby LOVES them :-) thanks! I'd like to win this swaddle for my baby. I'm expecting my first baby (girl!) this fall. This swaddle looks very nice. Thank you for the opportunity. I am not going to enter as I already have multiples in every size because I used them with Punky and they were a godsend! I have already had Zee in one her first night alive! I reckon they should be given to every new Mum in the hospital, they are gold! They take the hassle out of wrapping and they also keep little 'helpful' hands out of the way when you're trying to get a latch during a night feed as a bonus! I discovered these with #4 and also just loved them to bits. Even tried another type that the hands get wrapped across the chest but that is just not how they want to sleep. I had 2 of these, one in small and then had a medium. Since have lost the small, thought I had lent it to a friend maybe but it's gone :( We are trying for #5 (shhh!!) and I really need a new small! I would love to win this for my best friend, who is having a baby in October. This would be a great and useful gift for her! Love having Charlie in this swaddle! I'd love to try this with my new bub due in a couple of months. Having not used them previously it would be great to try out. I'd love one! We're expecting bub #4 and they weren't around when my youngest was a bub (who is almost 4 now!). I have friends who say they're fantastic! Would really really love one!